Henry Kisor lost his hearing at age three to meningitis and encephalitis but went on to excel in the most verbal of professions as a literary journalist. 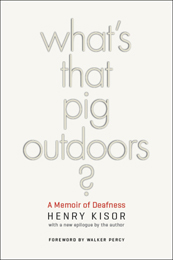 This new and expanded edition of Kisor’s engrossing memoir recounts his life as a deaf person in a hearing world and addresses heartening changes over the last t wo decades due to the Americans with Disabilities Act of 1990 and advancements in cochlear implants and modes of communication. Kisor tells of his parents’ drive to raise him as a member of the hearing and speaking world by teaching him effective lip-reading skills at a young age and encouraging him to communicate with his hearing peers. With humor and much candor, he narrates his time as the only deaf student at Trinity College in Connecticut and then as a graduate student at Northwestern University, as well as his successful career as the book review editor at the Chicago Sun-Times and the Chicago Daily News. Life without hearing, Kisor says, has been fine and fulfilling.